Iowa is home to a remarkably diverse array of architectural styles from colonial to postmodern. Architects as well known as Frank Lloyd Wright and Frank Gehry have left their mark in the state alongside prairie homesteaders. As we enter into a new decade, a greater emphasis is being placed on eco-friendly architecture, as evidenced by the upswing in LEED-certified buildings. The Daily Palette is proud to present a wide variety of Iowa architecture from many eras and movements. Find more information at aiaiowa.org. This home reflects Wright's interest in the horizontality of the prairie landscape. 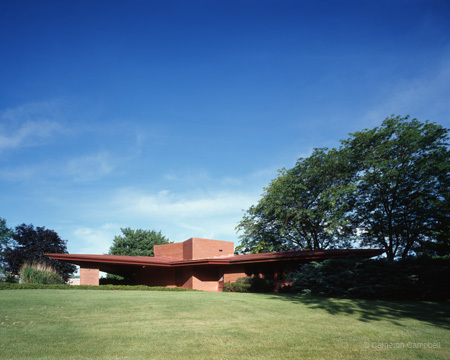 The dynamic, cantilevered roof dominates the initial view of the structure. The layout is also typical of many of Wright's homes with the kitchen and hearth at the center of the home, with the rest of the rooms radiating out.